Definition at line 22 of file UFSStoreState.h. Definition at line 21 of file StoreIOState.h. Definition at line 22 of file IORequestor.h. Definition at line 41 of file StoreIOState.h. Definition at line 51 of file StoreIOState.h. Definition at line 29 of file StoreIOState.h. Definition at line 69 of file StoreIOState.h. Definition at line 328 of file UFSStoreState.cc. References StoreIOState::e, flags, Store::Disk::index, StoreIOState::swap_dirn, StoreIOState::swap_filen, and StoreEntry::swap_filen. Definition at line 347 of file UFSStoreState.cc. References assert, pending_reads, and pending_writes. Definition at line 117 of file UFSStoreState.cc. References debugs, StoreIOState::swap_dirn, StoreIOState::swap_filen, and tryClosing(). Definition at line 89 of file UFSStoreState.cc. References assert, closing, debugs, DISK_ERROR, DISK_OK, doCloseCallback(), DiskFile::error(), HERE(), StoreIOState::swap_dirn, StoreIOState::swap_filen, and theFile. Definition at line 299 of file UFSStoreState.cc. References StoreIOState::callback, StoreIOState::callback_data, cbdataReferenceValidDone, debugs, freePending(), NULL, and theFile. Definition at line 193 of file UFSStoreState.cc. References assert, DiskFile::canWrite(), DBG_IMPORTANT, debugs, DiskFile::error(), MYNAME, pending_writes, theFile, and DiskFile::write(). Definition at line 394 of file UFSStoreState.cc. References DiskFile::canWrite(), doWrite(), flags, pending_writes, theFile, and tryClosing(). Referenced by openDone(), write(), and writeCompleted(). Definition at line 354 of file UFSStoreState.cc. References debugs, pending_reads, and pending_writes. Definition at line 26 of file UFSStoreState.cc. References assert, closing, creating, debugs, DiskFile::error(), FILE_MODE, StoreIOState::mode, openDone(), opening, StoreIOState::swap_dirn, StoreIOState::swap_filen, theFile, and tryClosing(). Definition at line 366 of file UFSStoreState.cc. References cbdataReferenceValidDone, closing, debugs, flags, pending_reads, and read_(). Definition at line 60 of file StoreIOState.h. References buf, StoreIOState::callback, StoreIOState::callback_data, StoreIOState::offset_, StoreIOState::read_(), size, and StoreIOState::write(). Referenced by store_client::fileRead(), MemObject::objectBytesOnDisk(), MemObject::stat(), and StoreEntry::swapOut(). Definition at line 64 of file UFSStoreState.cc. References closing, DBG_CRITICAL, debugs, drainWriteQueue(), DiskFile::error(), FILE_MODE, flags, HERE(), kickReadQueue(), StoreIOState::mode, theFile, and tryClosing(). Definition at line 25 of file StoreIOState.cc. Definition at line 18 of file StoreIOState.cc. Definition at line 125 of file UFSStoreState.cc. References assert, buf, DiskFile::canRead(), cbdataReference, closing, debugs, NULL, StoreIOState::offset_, opening, pending_reads, DiskFile::read(), StoreIOState::read, read_buf, reading, StoreIOState::swap_dirn, StoreIOState::swap_filen, and theFile. Definition at line 230 of file UFSStoreState.cc. References assert, cbdataReferenceValidDone, closing, debugs, DiskFile::error(), flags, RefCount< C >::getRaw(), len, NULL, StoreIOState::offset_, StoreIOState::read, read_buf, reading, StoreIOState::swap_dirn, StoreIOState::swap_filen, theFile, and tryClosing(). Definition at line 56 of file StoreIOState.cc. References StoreIOState::e, StoreIOState::swap_filen, and StoreEntry::swap_filen. Referenced by Rock::IoState::finishedWriting(), Rock::SwapDir::writeCompleted(), Rock::SwapDir::writeError(), and Rock::IoState::writeToDisk(). Definition at line 430 of file UFSStoreState.cc. References DiskFile::close(), closing, debugs, flags, HERE(), DiskFile::ioInProgress(), and theFile. Referenced by close(), drainWriteQueue(), ioCompletedNotification(), openDone(), readCompleted(), write(), and writeCompleted(). Definition at line 159 of file UFSStoreState.cc. References DBG_IMPORTANT, debugs, drainWriteQueue(), DiskFile::error(), HERE(), INDEXSD, Store::Disk::maxObjectSize(), StoreIOState::offset_, pending_writes, StoreIOState::swap_dirn, StoreIOState::swap_filen, theFile, and tryClosing(). Definition at line 273 of file UFSStoreState.cc. References debugs, drainWriteQueue(), DiskFile::error(), HERE(), len, StoreIOState::offset_, StoreIOState::swap_dirn, StoreIOState::swap_filen, theFile, and tryClosing(). Definition at line 89 of file StoreIOState.h. Referenced by Rock::IoState::callBack(), StoreIOStateCb::canDial(), Rock::IoState::close(), StoreIOStateCb::dial(), doCloseCallback(), StoreIOState::offset(), and StoreIOStateCb::StoreIOStateCb(). Definition at line 93 of file StoreIOState.h. Definition at line 90 of file StoreIOState.h. Referenced by Rock::IoState::callBack(), StoreIOStateCb::canDial(), StoreIOStateCb::dial(), doCloseCallback(), StoreIOState::offset(), StoreIOStateCb::print(), StoreIOStateCb::StoreIOStateCb(), Rock::IoState::~IoState(), StoreIOState::~StoreIOState(), and StoreIOStateCb::~StoreIOStateCb(). Definition at line 38 of file UFSStoreState.h. Referenced by closeCompleted(), ioCompletedNotification(), kickReadQueue(), openDone(), read_(), readCompleted(), and tryClosing(). Definition at line 37 of file UFSStoreState.h. Referenced by Fs::Ufs::UFSStrategy::create(), and ioCompletedNotification(). Definition at line 85 of file StoreIOState.h. Referenced by Rock::IoState::callReaderBack(), Rock::IoState::finishedWriting(), Rock::IoState::IoState(), Rock::IoState::read_(), StoreIOState::touchingStoreEntry(), Rock::IoState::tryWrite(), UFSStoreState(), Rock::IoState::writeBufToDisk(), Rock::SwapDir::writeCompleted(), Rock::SwapDir::writeError(), and Rock::IoState::~IoState(). Definition at line 88 of file StoreIOState.h. Referenced by drainWriteQueue(), kickReadQueue(), openDone(), readCompleted(), tryClosing(), and UFSStoreState(). Definition at line 86 of file StoreIOState.h. Referenced by Fs::Ufs::UFSStrategy::create(), ioCompletedNotification(), Fs::Ufs::UFSStrategy::open(), and openDone(). Definition at line 87 of file StoreIOState.h. Referenced by Rock::IoState::close(), StoreIOState::offset(), Rock::IoState::read_(), read_(), readCompleted(), Rock::IoState::tryWrite(), write(), Rock::IoState::writeBufToDisk(), writeCompleted(), and Rock::IoState::writeToBuffer(). Definition at line 36 of file UFSStoreState.h. Referenced by ioCompletedNotification(), Fs::Ufs::UFSStrategy::open(), and read_(). Definition at line 71 of file UFSStoreState.h. Referenced by freePending(), kickReadQueue(), read_(), and ~UFSStoreState(). Definition at line 101 of file UFSStoreState.h. 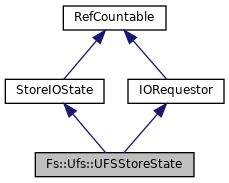 Referenced by doWrite(), drainWriteQueue(), freePending(), write(), and ~UFSStoreState(). Referenced by Rock::IoState::callReaderBack(), Rock::IoState::read_(), read_(), readCompleted(), StoreIOState::StoreIOState(), and StoreIOState::~StoreIOState(). Definition at line 125 of file UFSStoreState.h. 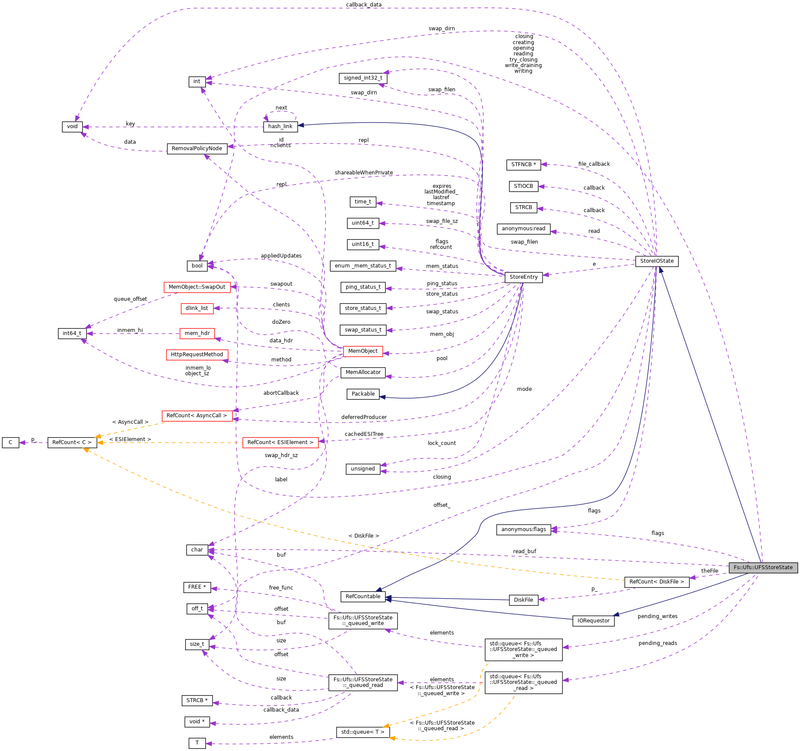 Referenced by read_(), and readCompleted(). Definition at line 39 of file UFSStoreState.h. Definition at line 83 of file StoreIOState.h. Referenced by close(), closeCompleted(), ioCompletedNotification(), read_(), readCompleted(), storeSwapInFileNotify(), storeSwapOutStart(), UFSStoreState(), write(), and writeCompleted(). Definition at line 84 of file StoreIOState.h. Referenced by close(), Rock::IoState::close(), closeCompleted(), Fs::Ufs::UFSStrategy::create(), Rock::IoState::currentReadableSlice(), ioCompletedNotification(), Rock::IoState::read_(), read_(), readCompleted(), storeSwapInFileNotify(), storeSwapOutStart(), StoreIOState::touchingStoreEntry(), Rock::IoState::tryWrite(), UFSStoreState(), write(), Rock::IoState::writeBufToDisk(), writeCompleted(), Rock::SwapDir::writeCompleted(), and Rock::SwapDir::writeError(). Definition at line 35 of file UFSStoreState.h. Referenced by closeCompleted(), Fs::Ufs::UFSStrategy::create(), doCloseCallback(), doWrite(), drainWriteQueue(), ioCompletedNotification(), Fs::Ufs::UFSStrategy::open(), openDone(), read_(), readCompleted(), tryClosing(), write(), and writeCompleted(). DPW 2006-05-24 The try_closing flag is set by UFSStoreState::tryClosing() when UFSStoreState wants to close the file, but cannot because of pending I/Os. If set, UFSStoreState will try to close again in the I/O callbacks. Definition at line 119 of file UFSStoreState.h. DPW 2006-05-24 the write_draining flag is used to avoid recursion inside the UFSStoreState::drainWriteQueue() method. Definition at line 111 of file UFSStoreState.h. Definition at line 40 of file UFSStoreState.h.